Manama, Apr. 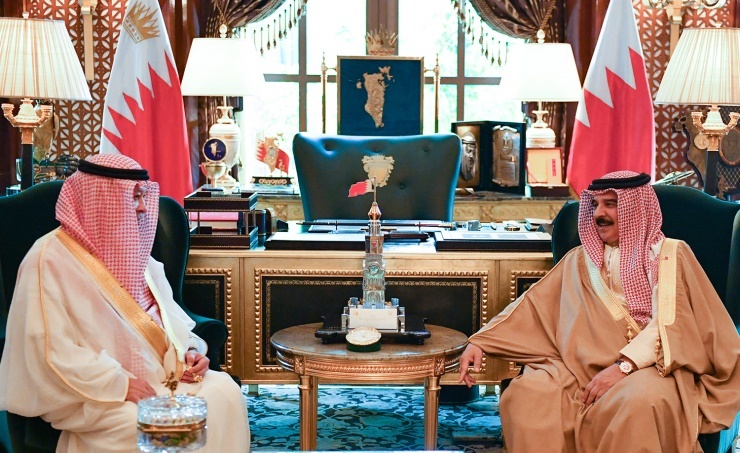 11(BNA): His Majesty King Hamad bin Isa Al-Khalifa received, at Al-Safriya Palace, HM Sultan Ibrahim Ibni Almarhum Sultan Iskandar Al-Haj Sultan of Johor darul takzim, Malaysia, marking his visit to the Kingdom of Bahrain. HM the King welcomed HM Sultan Ibrahim, hailing his visit which reflects strong bilateral relations binding the two brotherly countries. HM Sultan Ibrahim expressed deepest thanks to HM the King for his kind invitation to the Kingdom of Bahrain, hailing the warm welcome and kind hospitality. HM the King expressed Bahrain’s pride at the advanced level of relations of cooperation with Malaysia, commending the pioneering role of Malaysia in the Asian and international arenas. HM Sultan Ibrahim Ibni Almarhum Sultan Iskandar hailed HM the King’s efforts to develop Bahraini-Malaysian relations for joint ties to develop and prosper in all fields. Present were HM the King’s Personal Representative His Highness Shaikh Abdulla bin Hamad Al-Khalifa and HM the King’s Representative for Charity Works and Youth Affairs, Supreme Council for Youth and Sport (SCYS) President HH Shaikh Nasser bin Hamad Al-Khalifa.